On a hot day in Beijing, Ning Ma would eat these spicy chicken noodles cold. Now served in her restaurants Mama Lan, this traditional recipe is a favourite during summer. Put all the chicken ingredients, apart from the chicken, in a large pan with 1 litre water. Bring to the boil, add the chicken, then simmer for 20-25 minutes or until the chicken is cooked. The meat should come off the bone with little effort. Lift the chicken onto a plate and leave to cool, then shred into strips. Discard the skin, bones and cooking liquid. Mix the marinade ingredients in a medium mixing bowl, add the shredded chicken and marinate for 1 hour or longer. Mix the sesame paste ingredients in a small mixing bowl and set aside. Soak and cook the noodles according to the packet instructions, run under cold water for 2-3 minutes to remove the starch, then keep chilled until ready to serve. 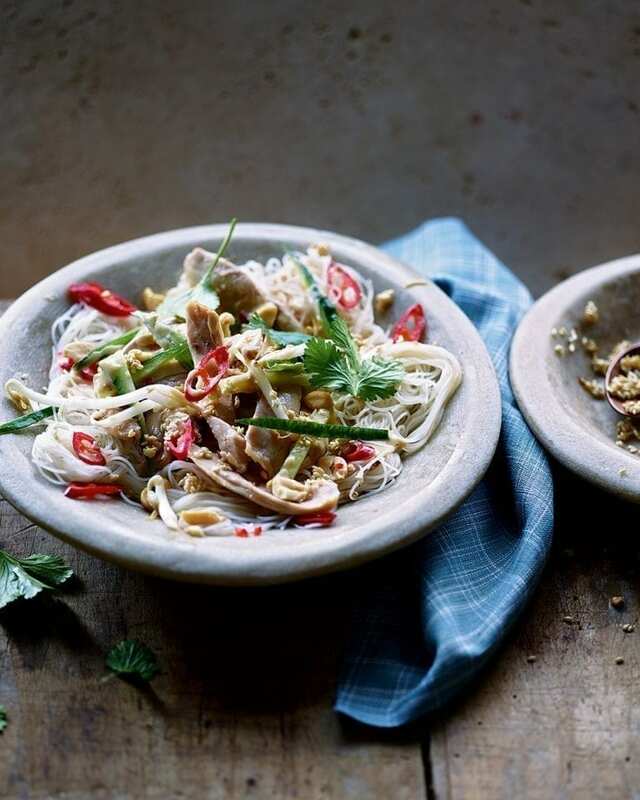 To assemble the ban mein, put the cold noodles in a bowl or on a platter and arrange the marinated chicken on top. Spoon over some of the sesame paste followed by the beansprouts and cucumber in a mound in the middle of the bowl. Sprinkle the peanuts around the outside, spoon over as much of the chilli oil as you want, then decorate with the coriander leaves, sliced chilli and sesame seeds. Serve cold. This dish is great as part of a buffet – you can prepare all the elements ahead and it’s served cold, so you can plate it up when you’re ready. Cook, then marinate the chicken up to 48 hours in advance. Keep it in the fridge in a sealed plastic container or a non-reactive bowl covered with cling film. The sesame paste can also be made up to 48 hours in advance; keep it in a jar or sealed container in the fridge.